Whitehorse is the capital of the Yukon and is situated on the banks of the Yukon River. It is named after the rapids, just upstream, that resembled the flowing manes of white horses. The White Horse rapids were the worst obstacle that the gold rush "Stampeders" had to face on the "Trail of 98". 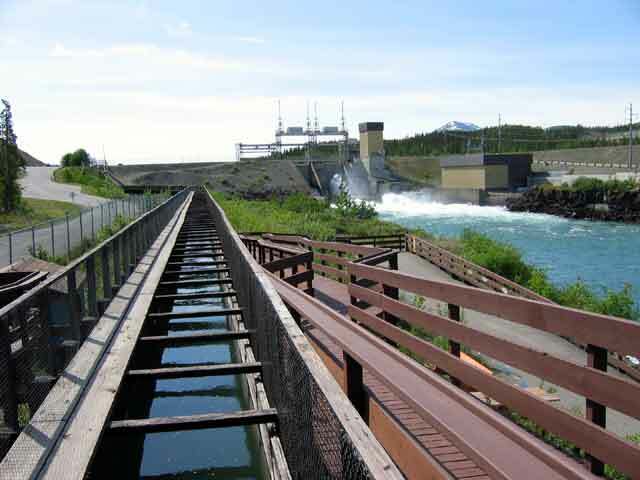 These rapids have been replaced by the Schwatka Lake reservoir, created in 1958 when the hydro-electric dam was built. 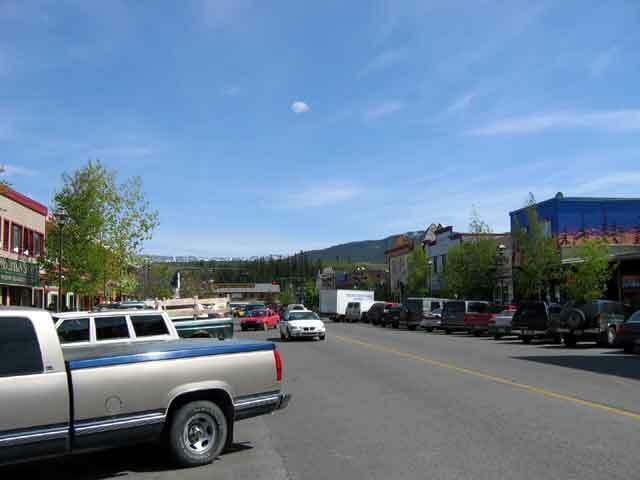 Whitehorse is a busy town, with a population of over 22,000. That is a large portion of the 30,000 population of the entire Yukon, eh? Whitehorse was incorporated in 1950, and in 1953, took over as the capital of the Yukon. Dawson City was the previous capital. 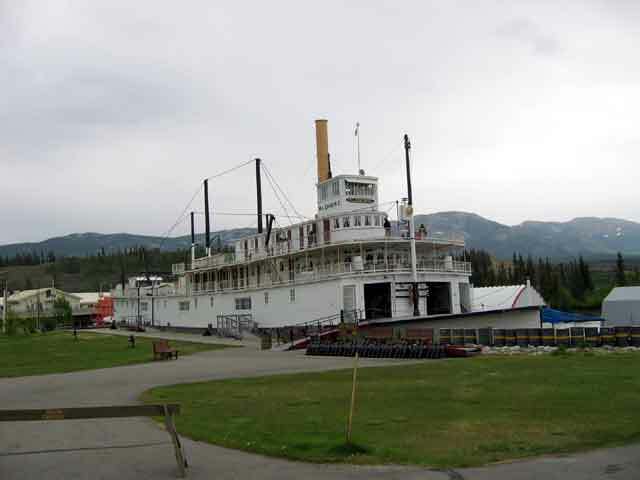 The S.S. Klondike is a retired river boat that is now a museum with guided tours. A fun thing to do. 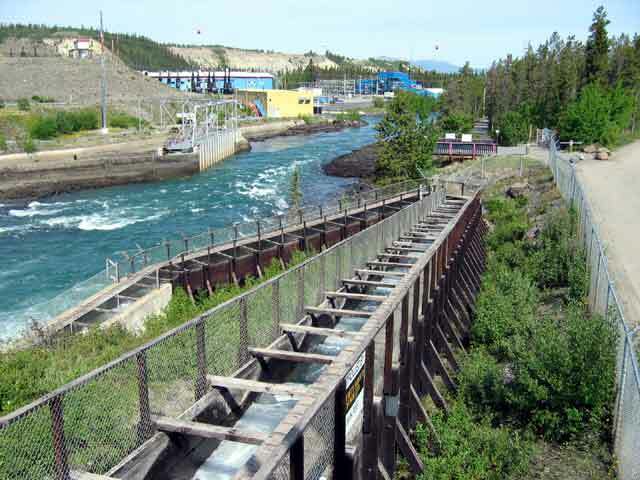 This fish ladder was constructed to allow salmon and other fish to move upstream around the dam. It is made of wood and is believed to be the world's longest of that type if material. There is a section where the sides are made of clear plastic so you can watch the fish as they make their way up the ladder. This is also used to count the salmon during their spawning migration.